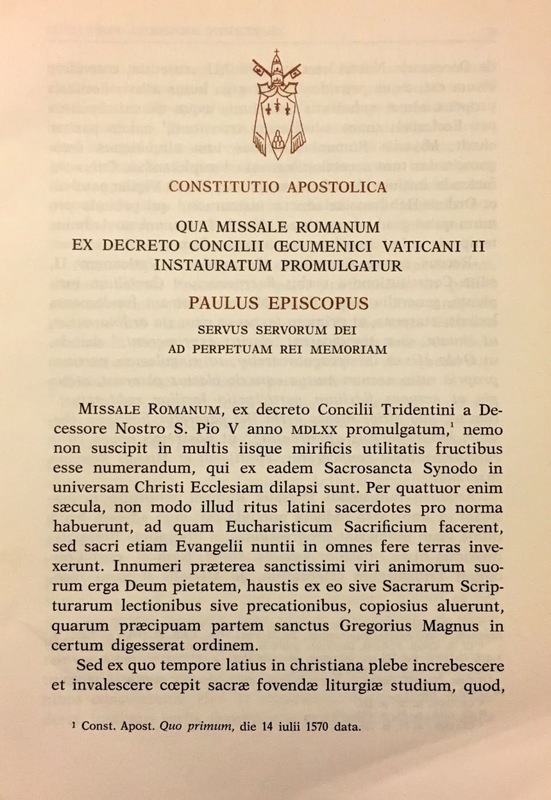 We are very grateful indeed to Dom Alcuin Reid OSB for sharing with NLM this article, marking the 50th anniversary of the Apostolic Constitution Missale Romanum, by which Pope Paul VI first promulgated the Novus Ordo Missae. Dom Alcuin is the founding Prior of the Monastère Saint-Benoît (www.msb-lgf.org) in the diocese of Fréjus-Toulon, France and the International Coordinator of the ‘Sacra Liturgia’ initiatives. This article draws from his paper “On the Council Floor: The Council Fathers’ Debate of the Schema on the Sacred Liturgy” published in U.M. Lang (ed.) ‘Authentic Liturgical Renewal in Contemporary Perspective’ (Bloomsbury, 2017). 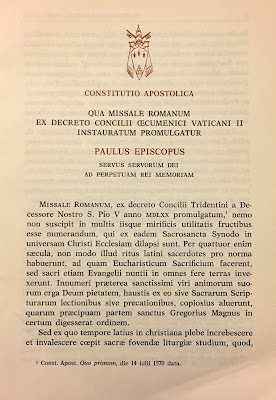 Fifty years ago today Saint Paul VI signed the Apostolic Constitution Missale Romanum by means of which he promulgated a new Order of Mass (Ordo Missae) for the Roman rite: a most significant step indeed in the implementation of the liturgical reform for which the Second Vatican Council called. “The rite of the Mass is to be revised in such a way that the intrinsic nature and purpose of its several parts, as also the connection between them, may be more clearly manifested, and that devout and active participation by the faithful may be more easily achieved. And yet, when this article of the Constitution was being debated on the Council floor in late October and early November 1962, it provoked no small controversy amongst the Council Fathers, some of whom feared “a revolution” rather than an organic development of the Ordo Missae as called for by the principle articulated in n. 23 of the same Constitution. Such was the consternation that on November 5th one of the bishops on the Council’s liturgical commission issued a clarification: “Hodiernus Ordo Missæ, qui decursu saeculorum succrevit, certe retinendus est.” (“The current Ordo Missae, which has grown up in the course of the centuries, certainly is to be retained,” together with specific examples of how this assurance was to be interpreted (called Declarationes). On the basis of this assurance and the detailed explanations which accompanied it, the article was passed and in due course became part of the Constitution. One can see much of what was anticipated in the Ordo Missae promulgated in January 1965: some reduction in the ‘later’ additions to the rite at the beginning and end of Mass, some simplification of gestures, the addition of prayers of the faithful, etc. Yet it is a fact that the body entrusted with the implementation of the Council’s Constitution on the Sacred Liturgy, the Consilium, organised by its ingenious and highly controversial Secretary, Father (later Archbishop) Annibale Bugnini CM, had little intention of a modest development of the Ordo Missae, as the schemata (the working drafts) of the Consilium’s Study Group 10 themselves demonstrate. The intention was to simplify radically and reconstruct freely. Indeed, in 1967 and 1968 Paul VI found it necessary personally to insist that the sign of the cross be retained at the beginning of Mass, that the Kyrie not be omitted when the Gloria is sung, that some prayers would be retained at the offertory and that they would speak explicitly of “offering”, and that the Orate Fratres not be abolished. It was also at Paul VI’s personal insistence that the Roman canon (Eucharistic Prayer I) was not discarded entirely. The Ordo Missae promulgated by Paul VI fifty years ago today was, then, not as radical as many of the reformers wished. But did it respect the assurance given to the Council Fathers that “current Ordo Missae, which has grown up in the course of the centuries, certainly is to be retained”? One can argue endlessly about individual elements of any reform: whether this gesture or text should or should not be set aside or introduced, etc., and any liturgical rite has added and lost such elements over the course of the centuries incrementally, organically as it were. But such reforms did not involve disproportionate change or substantial innovation—nor did the Fathers of the Second Vatican Council authorise such. Yet the Ordo Missae promulgated on 3 April 1969 may certainly be said, in the words of Paul VI himself, to contain the latter: “The major innovation,” he reports “concerns the Eucharistic Prayer.” Three new Eucharistic prayers were added (and more came later) in spite of the fact that the Fathers of the Council neither wished nor proposed such a radical reform: the Roman canon had been the anchor of the substantial unity of the Roman rite (in all its legitimate variants) for more than a thousand years. Paul VI also altered the formula of Consecration so as to standardize it amongst the various Eucharistic prayers. Whatever the prudence of this action, it was nevertheless within his authority so to do. One may also argue that the ritual and textual reform of the offertory rites was a substantial innovation, particularly theologically—even more so in some subsequent vernacular translations such as French. Whether the amount of smaller ritual and textual changes is truly disproportionate is a matter of judgement: I recall no one less than Michael Davies opining that the 1965 Ordo Missae was not a radical break with Tradition (it abolished the prayers at the foot of the altar and the last Gospel, etc.). Klaus Gamber held it to be the authentic implementation of the Council. 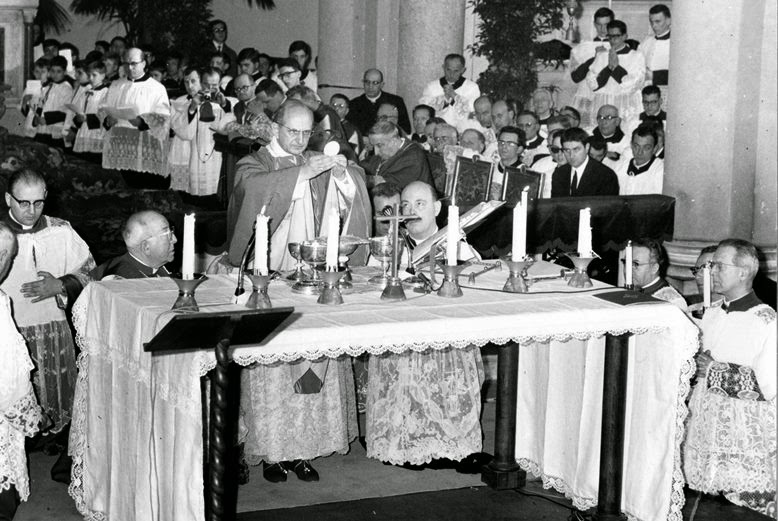 Pope Paul VI celebrates the first Mass in Italian at the church of All Saints in Rome, March 7, 1965. “The Mass will be celebrated in a rather different manner from that in which we have been accustomed to celebrate it in the last four centuries, from the reign of St. Pius V, after the Council of Trent, down to the present. Such legal positivism raises questions that take us too far afield here, but that such force was thought necessary is itself an indication that the “extraordinary change” brought about by the Apostolic Constitution promulgated 50 years ago was no incremental development, but a change of significant proportion. Evidence of the disproportion of what Paul VI described in his General Audience of 26 November of the same year as “the liturgical innovation of the new rite of the Mass” may also be found in the fallout following the promulgation and implementation of the new Ordo Missae, the most prominent being the famous 1969 “Intervention” prefaced by a letter signed by two Cardinals, Ottaviani and Bacci. Less obvious, but no less more real, was the rapid and radical decline in Mass attendance following the introduction of the new rites, evidence of which is increasingly testified by reputable sociological studies. To be sure there are many factors involved here, but it remains a fact that the promulgation of a new Ordo Missae and its attendant rites did not, as was expected, herald a new springtime of Christian life and worship in the Western Church. Nor did it arrest the decline: rather, there is evidence that it contributed to it. One may argue, of course, that ‘abuses’ of the new Ordo Missae are to blame and that when it is celebrated as it was intended it is fine. Liturgical abuse did—and sadly continues to do—unspeakable damage to the children of God, and zero tolerance is the only just policy in respect of them. But the new rites themselves were unwittingly predicated on an assumption that has increasingly undermined them as the years have rolled on: that those who celebrate them as liturgical ministers or lay faithful have a sufficiently solid catechesis and liturgical and theological formation. That is to say that it is entirely possible that Paul VI, Annibale Bugnini, their educated relatives and friends, etc., who had been well formed in the Faith and in the Sacred Liturgy prior to the reform could celebrate radically reformed rites with minimal damaging effect on their life of faith: the freedom from supposed ritual ‘clutter’ may even have enhanced them psychologically. But for those with different outlooks, for people with minimal formation, and in succeeding years for those who were subjected to weak or even erroneous catechesis or theological formation, the pared-down new rites themselves were just that: a stripped-down edifice increasingly battered by the cold winds of the post-modern world, offering ‘liturgy-lite’, rather than a solid, comfortable and familiar place of refuge, strength and sustenance. Psychologically and pastorally, then, the new Ordo Missae has left much to be desired. That is not to say that many, many Catholics did not accept it in obedience and live and pray and persevere in the Faith with it as the “source and summit” of their Christian life and mission. But those who do this week in week out are an increasing minority of the baptised faithful, and if we take the stated motivations of the Council and Paul VI seriously, fifty years later we need to look again at the question of the reform of the Mass. We need to ask whether some of what was jettisoned may indeed have had value after all, then and today. This conversation, commenced some twenty years ago by the then-Cardinal Ratzinger’s call for the discussion of a ‘reform of the liturgical reform’ and for a new Liturgical Movement, and continued today by Pope Francis’ Prefect of the Congregation for Divine Worship, Cardinal Sarah, is well underway, and is already bearing much fruit in the liturgical formation of many, especially the young. So too, Pope Benedict’s establishment that the more ancient liturgical rites may be freely celebrated in the Western Church has ensured the desire of the Council that the Ordo Missae which grew up in the course of the centuries has indeed been retained, at least for those who wish it. 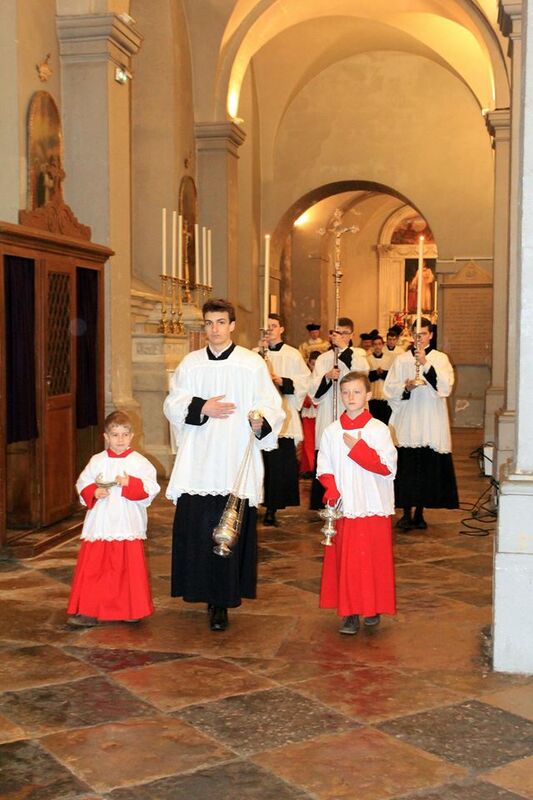 The phenomenon of the attraction to the young to the older liturgy and the high level of full, conscious and active participation that one encounters at contemporary celebrations of the usus antiquior is something with which this conversation must also reckon. Certainly, 50 years after its promulgation, there is no sign that the Ordo Missae of Paul VI is going anywhere any time soon. And even if it is an inorganic development and a disproportionate reform held in place by an extraordinary act of legal positivism, when celebrated according to the mind of the Church and in a spirit of continuity with liturgical tradition, it is nevertheless something valid and is a good. Half a century has given it its place in the life of the Church—though not as exclusively as those who constructed it and who imposed it would have liked. After all, the Church has room for “treasures both old and new” (Matt. 13, 52). The next 50 years shall no doubt bring some clarity in what is still, at times, an altogether too sensitive question for some clergy and laity to consider dispassionately, if at all. But this difficulty will pass. What liturgists shall write for the centenary in 2069 remains to be seen. Our task today is, surely, to be as honest and objective as we can about the issues at hand, and to do what we can to ensure the real and optimal participation of all of Christ’s faithful in the “primary and indispensable source from which all the faithful are to derive the true Christian spirit” (Sacrosanctum Concilium 14, citing St Pius X) that the Sacred Liturgy in fact is, through its optimal celebration in all circumstances. And if we find that the older rites are more efficacious in so doing, let us not fear—for it is the ultimate end (the salvation of souls) that Paul VI had in view 50 years ago that are of importance still, not his prudential decisions in respect of particular rites, whatever merit or not they may have had then or now.